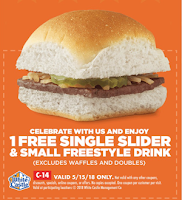 White Castle restaurants are offering a FREE Slider and a Small Freestyle Beverage Coupon! – Valid May 15th Only! No purchase required. Excludes double sliders, waffles and toast sandwiches! Limited to one per customer.